Rumble / Priceless Moments - What’s the most adorable thing in the world? Babies, of course! And what’s the second cutest thing? Dogs! 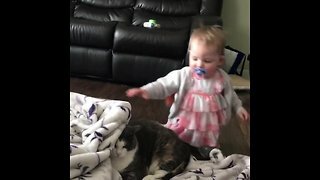 And when we have dogs and babies in one video? It’s like the ultimate level of cuteness in one video. It can get better than that! Sometimes the only person in our house who seems to understand dogs are babies and vice versa. They cuddle, they have conversations, and they’re best friends, and it’s pretty evident from this video these two, in particular, have an exceptional bond. 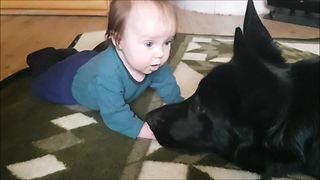 We merely love when we watch a video of a dog and baby sharing a unique friendship, we know that is the best and purest friendship of all. 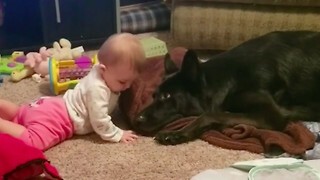 These parents are lucky enough to have an adorable baby, and sweet dog that shares an extraordinary friendship and they love to spend time together. Take a look at these two! Cairo and Dallas are caught on camera sharing a particular moment. How cute is that? They love to hold hands and talk to each other. They are so adorable together. Ah, and what about those fantastic names they have, Cairo and Dallas? Together they will be victorious, and they will grow up to be great friends! It can be told that dogs often behave differently around children, and they seem to treat them with extra attention to make sure that they don’t get injured. 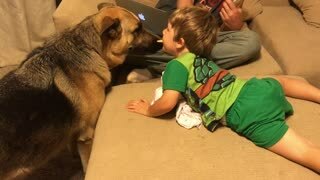 Dogs point to be more protecting of babies and small children as well, and this video is proof of how gentle dogs can be towards kids. 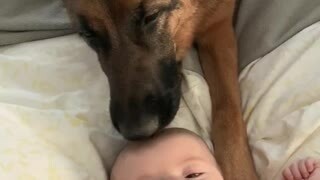 Dogs are amazing, and we think that every baby should grow with a dog. Is like having a best friend and security at the same time! How cool is that? Puppies can be a deep wellspring of solace for kids — notwithstanding when they&apos;re grasping troublesome life exercises. At whatever point kids feel sad, angry, or perplexed, they can turn to their pet. And that is something priceless. 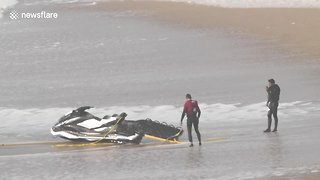 Was one video not enough? 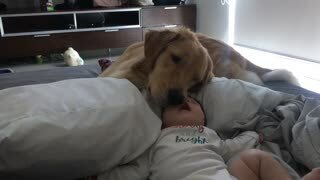 We have another adorable duo baby and dog and they love to show love for one another. Take a look at them! 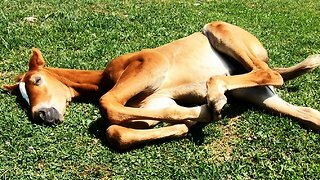 You can see the baby playing around with the dog, petting it and giving it hugs and kisses, while getting it all back and more from the big and gentle four-legged friend. How adorable is that? That&apos;s enough to brighten your day! You can tell that these two are going to be the best of friends as the baby continues to grow!